What’s the difference between garbage and trash? Garbage is basically food waste, paper products or most things that come out of the kitchen or bathroom. Trash can be lots of things including grass clippings, twigs, hedge clippings; or it can be junk or rubbish – generally, it’s anything that doesn’t come out of your kitchen or bathroom. What happens to my garbage or trash when I put it on the curb? Huntsville Residents The Huntsville City Sanitation Dept. picks up your garbage AND your trash. Madison Residents Your garbage is collected by the Madison County Waste Control Dept.. Your trash is collected by the city of Madison. Madison County Residents The Madison County Waste Control Dept. picks up your garbage. Your trash is collected by your county commissioner’s office. Once garbage trucks are loaded, the majority of them empty their trucks at the Huntsville Waste-to-Energy facility. One of the great advantages of this facility is that it reduces the volume of garbage by 90%. So, only 10% of the volume of garbage that we put on the curb is actually landfilled. By the time our garbage goes through the combustion process at the facility, it becomes ash, which is transported to the landfill for disposal. However, we go one step further before disposing of the ash. We remove the ferrous and non-ferrous metals from the ash and send them to be recycled. Another big advantage of the waste-to-energy facility is that the combustion process produces steam that Redstone Arsenal uses to heat its buildings and run some of its equipment. Also, the facility is equipped with state-of-the-art pollution control equipment, which monitors the round-the-clock combustion processes. Who do I call if my garbage is not picked up? For a holiday collection schedule go to the Public Works section of the City’s website. Or go to the Madison County website, scroll to the bottom of the County Departments page. Or go to the Madison County website and scroll to the bottom of the County Departments page. How do I dispose of flammable, toxic, or poisonous items in my garage? Bring these items to the Handle with Care household hazardous waste facility at 1055 A Cleaner Way in Huntsville on Monday – Friday from 7 a.m. until 5 p.m. No charge. Additional off‐site collection events will be held throughout the year. View the upcoming Community Collection Event (CCE) dates HERE. Special arrangements can be made for the handicapped and disabled by calling 256-882-0155. For a complete list of acceptable items, go to the Household Hazardous Waste Program page. Can I bring garbage to the waste-to-energy facility or the landfill myself – and what is the cost? Yes, both disposal facilities accept garbage from individuals and businesses. Disposal rates vary according to type of material and weight; so you may want to call ahead and get information, 256-880-6054. 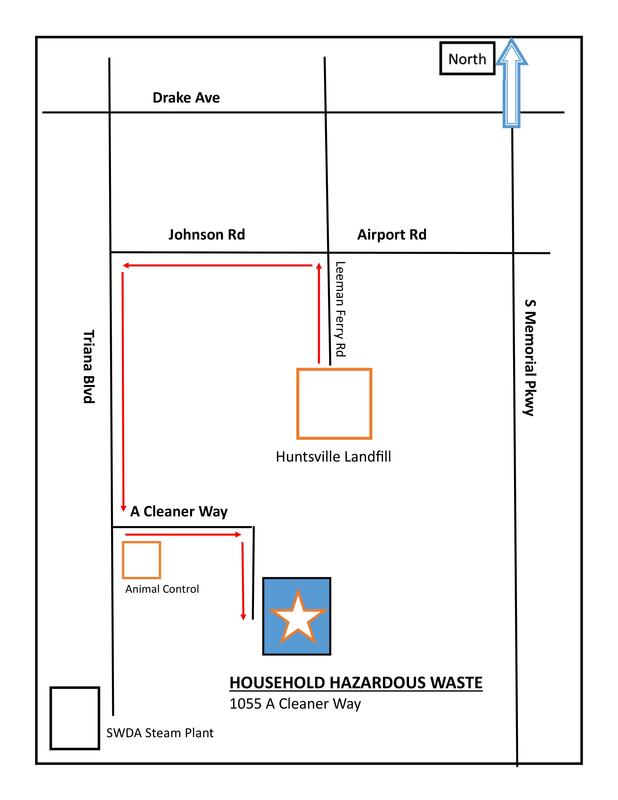 The Huntsville Landfill is open Monday through Friday, 7:00 a.m. to 5.00 p.m. The landfill is closed on weekends. The waste-to-energy facility is open Monday through Friday, 7:00 a.m. to 5:00 p.m., and Saturday, 7:00 a.m. to 11:50 a.m.
I’ve just done a major garage/storage building clean up and want to dispose of some “stuff” – do I take it to the waste-to-energy facility or the landfill? Items like paint/paint products, lawn and garden poisons, used motor oil, antifreeze, automotive fluids, cleaners, solvents, acids, batteries and fluorescent lights should be taken to the Handle With Care household hazardous waste facility, 1055 A Cleaner Way Monday – Friday from 7 a.m. – 5 p.m. For a complete list of acceptable items, go to the Household Hazardous Waste Program page. How do I get a blue recycling bin? Cardboard – must be broken down flat, smaller than 2’ x 2’, and fit inside of your recycling bin. Larger items may be dropped at the Recyclery, 1004 A Cleaner Way, Huntsville, AL 35805. Please RINSE and REMOVE lids and pumps. Containers may be crushed to conserve space. bag beside your blue bin. securely. Put the container Next to your recycle bin. It is any product or material that can present an environmental hazard when used, stored, or disposed of improperly. Residents of Huntsville and Madison County can safely dispose of these items at the Handle With Care household hazardous waste facility, 1055 A Cleaner Way Monday – Friday from 7 a.m. – 5 p.m. For questions, please call 256-882-0155. When is the household hazardous waste collection? Monday – Friday from 7 a.m. – 5 p.m. at the Handle With Care household hazardous waste facility, 1055 A Cleaner Way. Additional off‐site collection events will be held throughout the year. View the upcoming Community Collection Event (CCE) dates HERE. For more information, go to the Household Hazardous Waste Program page or call 256-882-0155. What are the landfill hours? Rates? Address? If I want to tour the waste-to-energy facility or the landfill, who do I contact? What is included in these waste disposal facility tours? What type of groups can come on tours? Tour groups are comprised of everyone from elementary school students to senior citizens. Reservations can be made by calling the above. Typical tours include a discussion about the 3 R’s (reduce, reuse, recycle), our community’s waste handling practices, and a tour of the waste-to-energy facility and/or a driving tour of the landfill. Come see if you can find the Cheerios box you threw away – among the 2,000 tons of garbage at the waste-to-energy facility. My employee lost a scale house ticket and we need to get a copy? Ticket copies are available by calling 256-880-6054. Cost per copy is $10. Business accounts are available. Click here for more information. Who do area businesses call to get information about hazardous waste disposal? Please call 256-880-6054 for assistance.